The absurdity of human existence is universal as Teater Garasi succesfully showed in their recent performance of Samuel Beckett’s classic play Endgame. We are all on the Earth and “there’s no cure for that!” as the lame tyrannical narcissist Hamm points out repeatedly in the play — something that holds true in post-Reform Indonesia as well as the work’s late 1950s original European setting. 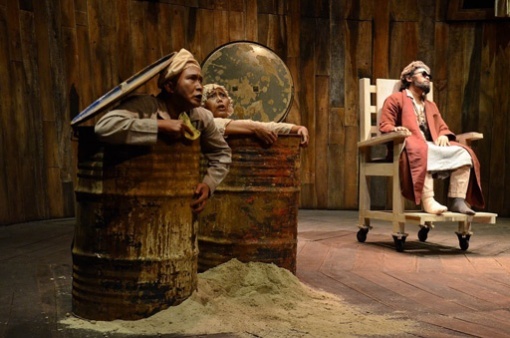 Teater Garasi, the now established and mature Yogyakarta-based experimental theater company, revisited the satire 15 years after its presentation of the play. The troupe first brought Hamm, Clov, Nagg and Nell to life in 1998, when the country was in a period of change, disruption and euphoria. Back then, the company’s interpretation of the tragicomic play was serious, or in the words of codirector Landung Simatupang, “stingy on laughter”, as they reflected on how Soeharto managed to postpone his downfall for too long. As hilarity rises in Indonesia’s increasingly absurd democracy — with its celebrity politicians, graft ridden political parties and government inaction on religious violence — Garasi indulged in Beckett’s humor when presenting Endgame this time. Endgame is a one-act play set in a post-apocalyptic world. Hamm is bound to his wheelchair, ordering around his reluctant servant, Clov, who is so stiff that he is doomed to never sit down. “Every man has his specialty,” says Hamm. Nagg and Nell, Hamm’s parents who are also immobile, live inside corrugated bins, their limbs lost after a bicycle accident. Outside of their grey shelter awaits death. The four souls are trapped in a game of mundane repetitive acts and conversations with nowhere to turn. Hamm, played in turns by Garasi director Yudi Ahmad Tajudin and play codirector Gunawan Maryanto, is portrayed as a smug blind tyrant who feels good about himself and his knack of language. Clov, played by Whani Darmawan and Theodorus Christanto, is a simple-minded servant with a speck of defiance. He answers with a straight face to Hamm, but keeps himself bound to his overbearing lmaster. Nagg (Kusworo Bayu Aji and MN. Qomaruddin) is Hamm’s father who has lost the respect of his son and slowly realizes the irrelevance of his overused comic routine. And Nell (Erythrina Baskoro and Arsita Iswardhani) is Hamm’s mother, who finds the tragic essence of comedy before her demise. Why don’t you kill me asks Hamm of Clov, who replies cooly and automatically: “I don’t have the combination of the cupboard”. Clov: “I couldn’t finish you”. Hamm: “Then you won’t finish me”. “Yes, yes, it’s the most comical thing in the world. And we laugh, we laugh, with a will, in the beginning. But it’s always the same thing. Yes, it’s like the funny story we have heard too often, we still find it funny, but we don’t laugh anymore”. And indeed, they don’t feel like laughing. “Don’t we laugh?” asks Hamm. “I don’t feel like it,” Clov answers after a moment of reflection. “Nor do I,” Hamm answers. Garasi director Yudi said that the group’s interpretation of the play this year reflected the current situation. The conversations in the play were as funny as the situation the country is facing. “We see the 98’ movement falling into a silly whirpool. Laughing at it would be as if we are cool with this difficult and silly situation,” Yudi said. “We cannot laugh. It’s funny and hilarious, but we can’t laugh at it like any other comedy,” Yudi said. The ability to find the humor behind the absurd is what Garasi aimed to achieve through its presentation of Endgame. Yudi said that he first encountered the script for Endgame in 1992 and was immediately caught by the strength of its dialogue. He struggled to translate the English text to Indonesian between 1992 and 1994. Garasi performed Endgame in 1998, riding the wave at the end of the regime. This year, Garasi performed Endgame as part of Salihara‘s Helateater festival. Beckett wrote Endgame in French in 1953 and the play was first performed in London on 1957, titled Fin de Partie. The title referred to the last moves in a chess game, when the end is near but the moves had to be taken anyway. Beckett translated the play from French to English himself. For this year’s performance, Yudi worked with Jean-Pascal Elbaz, former director of the French Cultural Center in Yogyakarta and producer of Endgame in 1998, in translating the script from French to Indonesian. Yudi said that there are things that are lost and things that are found in every translation. “In French, there is vous and tu, which give a richer meaning and can be adapted to Indonesian with anda dan kamu. We wouldn’t find that in the English translation,” Yudi said. Aside from what can be found (or lost) in translation, Garasi succeeded in presenting dark Beckett’s dark comedy. Endgame is a tragedy wrapped in humor wrapped in, to use Yudi’s words, a “sober optimism”. Amid the Indonesia’s everyday insanity, some sobriety is always welcome.